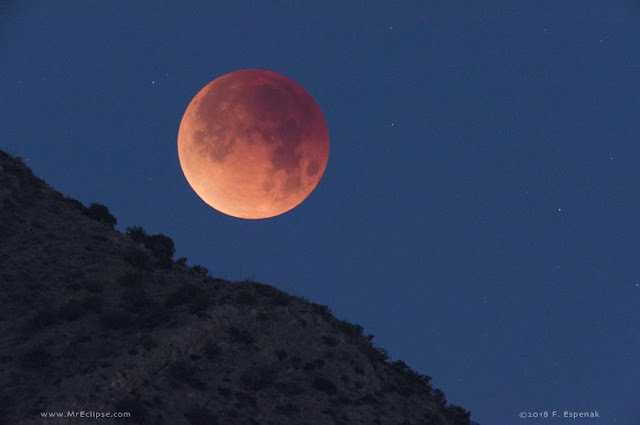 Last week's supermoon/lunar eclipse as seen from Arizona. I saw it from the plane on my way back to Santiago. After all the drama of missing my original flight from Punta Arenas and having to scramble to rebook, I'd forgotten about the eclipse -- it had come up on the trip a few times, with all of us thinking it was too bad we wouldn't get to see it from Antarctica. I was seated next to the window on the plane, and a bright red light outside caught my eye. If I'd been looking west I would have assumed it was a spectacular sunset, but I was on the other side of the plane, and the mountains below were shrouded in mist and though I thought it was maybe some kind of reflection, I couldn't figure out how that was possible. I heard a man in the seat behind me say, “What the hell is that?” and I thought, Okay, it's not just me -- that is really strange. Within a couple of minutes it had risen above the clouds enough for me to recognize the full moon, and I remembered that there was going to be a lunar eclipse, so that was why it was so red. The man behind me remained mystified, however. “That can't be the moon.” He went on to explain how the moon is different in South America from North America, and since it had been almost full at home, it couldn't be full down here and that red thing must be something else. He was still talking about it when we landed, still convinced that it couldn't possibly have been the moon.